eJuices.com Coupon Code! 20% Off + Free Shipping! * - Daily Vaping Deals & The Best Vape Product Reviews at Vaping Cheap! 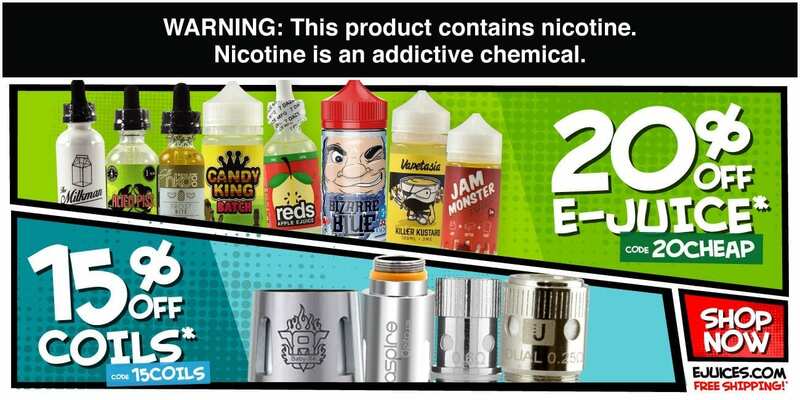 eJuices.com is offering 20% off to any new Vapingcheap.com customers. In addition, they’re offering 15% off coils! Click Here to shop over 2,100 E-liquid, hardware, coil and vape accessory brands. With competitive pricing and an additional 20% off, it’s easy to make eJuices.com your one-stop shop vape authority. Don’t forget to check out our Hot Deals section where you can save up to 90% on select items. Click Here to visit eJuices.com now. Shop Here! Shop Hot Deals Here! eJuices.com offers an amazing selection of over 2,100 E-liquid, hardware, coil and vape accessory brands. Our comprehensive website makes it easy to find nearly every E-liquid and vape suppliy option. Enjoy FREE Shipping* on all U.S. orders! Use coupon code CHEAP20 at checkout to receive 20% off* sitewide. * Valid for new customers only. Must use coupon code at checkout to receive savings. Cannot be used in conjunction with any other offers. Free shipping included on all orders originated in and delivered to the Continential U.S. Some U.S. state exclusions apply. See website for full Free Shipping terms and conditions. Shipping, taxes and other fees may apply. Delivery dates not guaranteed. Some exclusions and item quantity minimums may apply. Limit of 1 coupon per household. Limit of 1 use per coupon, per customer. Not valid on previous purchases. Offer valid from 12:01 AM PST 09/28/17 and ends 11:59 PM PST on 10/31/17 or while supplies last.